Like a dream, Spielberg’s first Disney movie is likely to have its impact felt for some time to come. The BFG is based on the 1982 children’s book by Roald Dahl. It’s about a giant who — essentially — farms dreams and plants them into the sleeping minds of children and parental units residing in greater London. Mix that source material with Steven Spielberg and this, his first production for Disney, and the results would appear to be limitless. After all, Spielberg makes reference to Disney in Close Encounters of the Third Kind; When You Wish Upon a Star works as a musical subtheme in his own classic about humans encountering aliens from outer space. And Disney, of course, is an empire built on the power of dreams. It’s a surprise, then, to find the end result is an easily-digested confection that actually understates the dream element. Working through it afterward, the first reaction was a sense of The BFG being too short (O the irony of that statement). It’s not — in terms of run time it’s nearly 2 hours. That’s a testament to how smoothly the material plays. 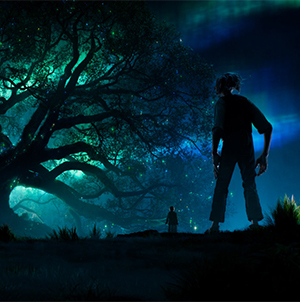 As for the handling of the dreams element as a component of Spielberg mashing up with Disney, it’s a comment made by the BFG (nothing dirty here in the new millennium; it stands for “Big Friendly Giant”) which puts those dreams into context: The physical dream itself is quick, but the after-effects linger for a long time. It turns out the BFG is himself a runt in comparison to the much more abrasive and warmongering giants of the village. Sophie is in her own way an orphan among the other orphans; wise beyond her years and annoyed by the utter incompetence of the orphanage’s head mistress. Sophie hates the orphanage; she’s always being punished. So, for her, running away with a BFG is the perfect antidote to her hard-knock life. Sophie and the BFG form a bond as outsiders and create an alliance to overthrow the mean-spirited, child-eating kidnappers. It’s a fancy flight of fantasy as Sophie and the BFG enlist the aid of none other than the Queen of England. She makes a phone call that tells us this world is in the 1980s. She calls Nancy and asks her to wake up Ronnie. True to form, Spielberg gets a wonderful performance out of Barnhill; it’s one of the many talents with which Spielberg finds himself unrivaled. Henry Thomas, Drew Barrymore, Christian Bale and Dakota Fanning are among the rising stars who benefited from Spielberg’s direction. And, of course, the visual effects with which the BFG comes to life are their own source of magic. This giant can walk the streets of London and manage to blend in with his surroundings by way of quick thinking. Equally seamless are the effects which allow his giant frame to reside side-by-side with his tiny young orphan friend. The last time Spielberg collaborated with screenwriter Melissa Mathison was on the “Kick the Can” episode of The Twilight Zone: The Movie back in 1983. But, much more famously, they worked together the year before on E.T. The Extra-Terrestrial. Sadly, Mathison died in November 2015, but The BFG serves as a sweet return to the important themes of childhood and the power of the imagination. Even as this year marks the 34th anniversary of that landmark movie, it’d be a mistake to constantly compare The BFG to E.T.. Both have their place and they can easily co-exist. The BFG in many respects reflects the maturing experiences of Spielberg himself and the tempered storytelling he’s built while making other landmarks such as Schindler’s List, Saving Private Ryan and Minority Report, among so many others. As it is, even Spielberg can’t resist a tiny bit of self-indulgence. The end credits include a note about an E.T. doll and Universal Pictures, so somewhere in the movie — likely in the orphanage or a child’s bedroom — is an E.T. that slips by without bringing attention to itself.